Title: Report to the Academy (re: The NEW Conflict of the Faculties) Author: Gregg Lambert Series: Critical Studies in the Humanities Imprint: The Davies Group, Publishers soft cover 314 pp. USD 24.00 ISBN 978-1888570601 September 2001 Report to the Academy addresses the signs of the perceived crisis of the first-world university as the result of its take-over by a new model of administrative rationality. Rather than seeing this as an entirely new development, Professor Lambert reveals the striking similarities between the present day conflict over the idea of the university as a social and cultural institution, and the conflict over reason first outlined by the eighteenth-century philosopher Immanuel Kant. Taking up the original argument of Kant’s The Conflict of the Faculties, as well as more recent arguments by philosophers and cultural critics such as Jacques Derrida, Jean-Francois Lyotard, Jurgen Habermas, Fredric Jameson, and Bill Readings, Report to the Academy offers a lively and compelling interpretation of the most critical issues underlying the contemporary debates over the fate of higher education. Lambert concludes his “report” by framing these issues in terms of two guiding questions, which he addresses to faculty and administrators alike: “What should count as “critical” social and cultural knowledge?” and “Who should have the authority to decide?” These questions, Lambert argues, return us to the very heart of the university’s mission for the larger society, and should become the occasion of “a new conflict of the faculties.” Parts one and two of Report to the Academy attempt to familiarize the reader with the principle issues involved in the discussion over the past ten years (particularly with regard to the role played by “theory”), while part three engages in a more technical discussion of a notion of critical knowledge that underlies competing discursive camps in the academy today. As the subtitle suggests, the primary objective of the work is to examine the nature of “the conflict of the faculties” that now conditions the relation between power and knowledge in the contemporary first-world university. Such an examination, as argued explicitly in part three, should cause the “critical faculties” in the university to scrutinize some of the more dogmatic and even mythological elements that belong to their understanding of “critical social knowledge.” Outline of the report: Memorandum re: Who Speaks for the University Today? Part I The University in the Ears of its Publics Abstract I(a) The conflict of cultures I(b) The return(s) of the philosopher I(c) The subject at large: on Derrida’s “position(s)” I(d) The university in the ears of its publics Summary & Transition Part II. The Postmodern Condition Y2K Abstract II(a) Assessing Lyotard’s Report on Knowledge 20 years after II(b) The university in cyberspace II(c) How philosophy originally solved the problem of legitimation II(d) The rise of the performativity principle and the crisis of “de-legitimation” (nihilism) Summary & Transition Part III Lyotard’s War Abstract III(a) The trouble with consensus (homologia) III(b) The phrase — there is a language (logos) III(c) Dueling meta-narratives III(d) Who bears witness for the witness? On the “ethical turn” Summary and Transition Part IV Conclusion Anent: The question, “What is critical in critical knowledge today? Summary (of the five theses) Acknowledgements Notes Reviews Report to the Academy is a major reflection on the state of the university today, especially on the vexed question of the role of the humanities in the new transnational and corporation-dominated university now coming into being. Anyone teaching humanities today will be aware of the changes that are taking place with unprecedented rapidity, but it is not all that easy to reflect with objectivity on just what those changes are or to explain them. Lambert's book does a superb job of accomplishing that, through careful readings of work by Kant, Lyotard, Derrida, Jameson, Habermas, Luhman, and Readings. Of special importance is his recognition of one important factor not made salient in earlier work. The university library used to be the major repository and data-base for the accumulated learning of our culture. You have to have proper credentials to have access to that data-base. Now the Internet is replacing the library as a kind of universal data-base, and one major function of the university is fading. You don't need to be in the university to have access to more and more material, for example the illuminated manuscript books of William Blake, once available only to a few specialists. Among many other astute insights, Lambert's book recognizes what a major change this is in the social role of the university. — J. Hillis Miller, UCI Distinguished Professor of English and Comparative Literature, University of California, Irvine. In the wake of the culture wars, the academic job crisis, the drive for corporate sponsorship, and the increasingly prominent place of college sports, the contemporary American university, perhaps our most vital public institution, seems to have lost its bearings. 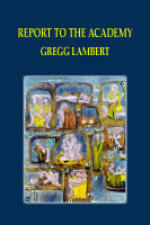 Gregg Lambert’s Report to the Academy takes a timely step back from all the brouhaha to conduct an analysis of the philosophical grounds of the university, from Kant to Derrida, Lyotard, and Readings. Next to Reading’s University in Ruins, (Lambert’s) Report to the Academy is an important statement advocating the “postcritical” university, one that productively questions both current disciplinary and administrative logic. — Jeffrey J. Williams Professor Lambert's Report to the Academy is at once the work of a public intellectual concerned about the institutional and intellectual future of the humanities, and the work of a fine literary scholar commenting upon recent discussions of these issues by Lyotard, Derrida, Readings and others. On both counts it is an outstanding contribution to an important debate. — Paul Patton, Department of Philosophy, University of Sydney Author Gregg Lambert teaches in the English Department at Syracuse University. In addition to Report to the Academy, he is the author of The Non-Philosophy of Gilles Deleuze, The Return of the Baroque, and The Culture of Strangers (forthcoming). His articles and papers have appeared in such diverse journals as Strategies (UK), minnesota review, Angelaki, Literature and Theology, Crossings, Journal of Cultural and Religious Theory, Postmodern Culture, and the Routledge Encyclopedia of Postmodernism.